In exclusive restaurants where the cost of a meal could be double the average monthly salary, they thoughtfully omit the prices from the menu to avoid spoiling your appetite. While it’s common knowledge that there’s no such thing as a free lunch, the price of that lunch may be far more than you bargained for. Israel is a war zone with two fronts: Not only are we constantly threatened and attacked by our cousins, the children of Yishmael, a billion of whom surround us, but also right in our own backyard we are often vilified by a secular culture inimical to Torah values. Calvin Klein does not like Rabbi Klein. This latter challenge has created a “siege mentality” in the Israeli Orthodox mind. For example, in England to play or be interested in soccer is no harbinger of incipient atheism. Here in Israel, however, a child who is more interested in kicking a ball around a field than learning Rishonim runs the risk of being marginalized, and consequently associating with the least salubrious elements of Israeli society. Soccer in Israel is not a game or a sport. It’s akin to “avoda zara” — idol worship. Abroad, the lines that distinguish acceptable from non-acceptable Torah-observant behavior are much grayer. Here in our Holy Land the divisions are as sharp as black and white. Not all children are cut out to sit over a Gemara for 10 hours a day. Those who are forced to do so against their nature and against their will either go through the motions, bored out of their minds, spending more time engrossed in the coffee machine than in Tosefos, or ironically, if they are more honest, they will buck the whole system and end up “on the streets”. Everyone will agree that in an ideal world it’s better for a young boy to learn for three hours and then go and kick a piece of leather around a field than to find himself on skid row with junkies and other evils. The priceless advice of our Sages: “Educate a child according to his way” is but one casualty of living “under siege”. Our Sages never shrunk from pointing out both small and major mistakes of our Forefathers, for we can learn as much from their mistakes as from their virtues. They point out that the striking differences between Avraham’s grandchildren may come more from mistakes in their upbringing than in their innate temperaments. When Esav and Yaakov were little, it seems that no attention was paid to the slumbering — and vast — differences between them. Both had exactly the same education. 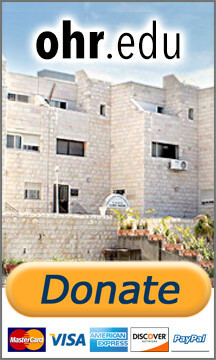 To send Esav to the same Yeshiva as Yaakov was courting disaster. Given a studious, sedate and meditative life, a Yaakov will imbibe knowledge with ever-increasing zeal and zest, while an Esav will count the hours and minutes until he can throw out the old books, and with it an entire purpose for life — since he sees nowhere that he can integrate this one view of the world into his nature. There is nowhere in the world that one can bring up children with such love and attachment to Torah, and with such separation from the lures of the world, than in the black-and-white world of Eretz Yisrael. For some of our children, however, that purity comes at a steep price. And please don’t think that I’m suggesting that things could or should be otherwise. I’m just saying that if we don’t want to end up with a tab that would put an exclusive French restaurant to shame, we must find a way for those embryonic Esavs to find their niche too amongst the Twelve Tribes of Yaakov.